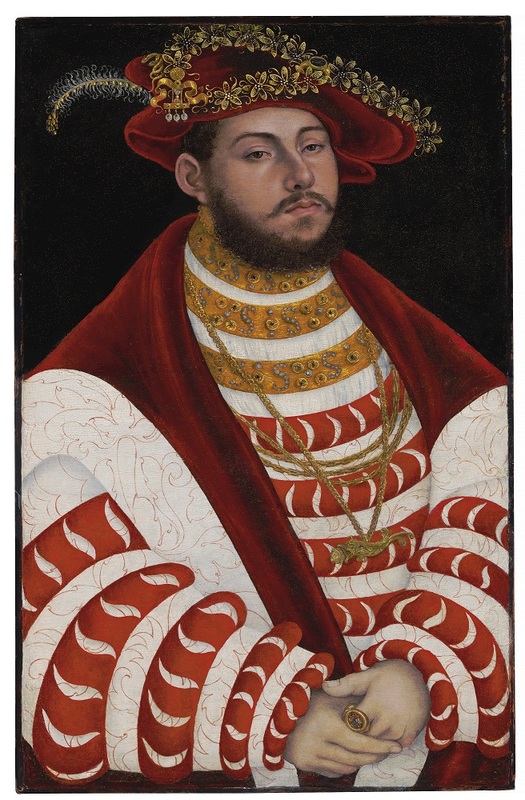 Christie’s is honored to present for sale Lucas Cranach the Elder’s Portrait of John Frederick I, Elector of Saxony, called John Frederick the Magnanimous, once part of Fritz Gutmann’s renowned art collection in the pre-war Netherlands. Missing for nearly 80 years before its recent rediscovery in America, Christie’s is privileged to have facilitated the return of this important work to the Gutmann family. Cranach’s Portrait of John Frederick I, Elector of Saxony will be presented in public exhibitions in Hong Kong (March 30 – April 4) and New York leading up to the Old Masters auction on April 19, 2018 in Christie’s Rockefeller Galleries with an estimate of $1,000,000-2,000,000. Cranach’s Portrait of John Frederick I, Elector of Saxony had occupied pride of place in the Gutmann family estate ‘Bosbeek’ in Heemstede, Netherlands. It was last publicly displayed in Rotterdam in 1938, on loan from Fritz Gutmann to the Museum Boymans. Following the rise of Nazism and then the Occupation of The Netherlands in May 1940, the Gutmann collection was a particular focus of interest for the Nazi high command and their agents. The Gutmann collection was comprehensively looted (confiscated and forcibly ‘sold’ during the war), with many works acquired for Hitler and Goering. The family’s possessions were scattered and tragically Fritz and his wife Louise were murdered in the concentration camps of Theresienstadt and Auschwitz respectively. While the exact path of this painting after 1940 is unknown, the quest to trace and recover it has been a cherished hope for two generations of Gutmann heirs. Simon Goodman, grandson of Fritz, has dedicated many years to researching the lost collection, successfully reclaiming many works for his family. He continues to seek a number of significant Old Master and Impressionist paintings. Simon has written of his experiences in his acclaimed book The Orpheus Clock: the search for my family’s art treasures stolen by the Nazis. Following an approach by persons in possession of the work, who acknowledged and addressed the losses suffered by the family at the hands of the Nazis, Christie’s facilitated a return to the Gutmann heirs. The return of the painting honors international initiatives to address the ongoing challenge of Holocaust-era assets. The portrait, painted in the 1530s, depicts John Frederick I (1503-1554), known as John Frederick the Magnanimous, an electoral prince and Head of the Schmalkaldic League of Germany, clad in splendorous attire. The last Elector in the Ernestine Saxon line, John Frederick was an ardent supporter of Martin Luther and the Reformation and is considered one of the founders of the University of Wittenberg. He married Sibylle of Cleves in September 1526, who Cranach equally portrayed on numerous occasions. Cranach paints John Frederick half-length, set against a dark background. The Elector wears four gold chains with a pendant in the shape of a dolphin around his neck. His fashionably slashed doublet is decorated with three gold collars set with pearls and precious stones forming the letter “S”. He wears a signet ring on his left index finger and is crowned with a garland of enameled flowers. The painting is one of Cranach’s most refined portrayals of the Elector John Frederick, who at the time it was painted was the artist’s greatest patron and close friend. Louisa Howard, Junior Specialist, Old Master Paintings: ‘I love Domenico Gargiulo’s Adoration of the Shepherds. It probably dates to the first half of the 1650s and conveys the artist’s realistic approach to the world of agriculture during this period.